Minister for Interior, Rehman Malik on Monday said security would remain high alert till 10th of Muharram-ul-Haram of all Imam Bargahs in view of terrorist threats. 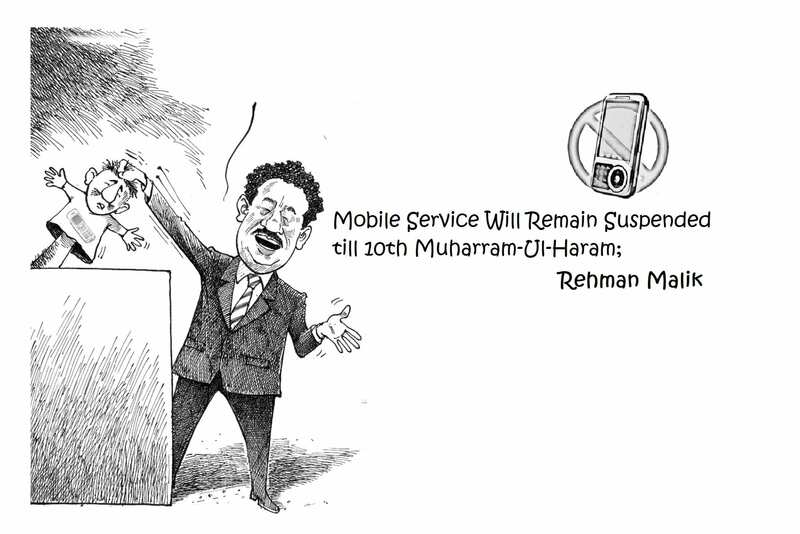 So mobile service will remain suspended till 10th Muharram. No one will able to connect to their loved ones through mobile service. All of this is done due to security reasons to minimize the security threats to all imam barghas. All possible measures are being adopted and strategies have been planned to ensure security for citizens and peace in the country as per directions of the President and the Prime Minister. [pull_quote_center]Cellular services will be suspended on 9th and 10th of Muharram along with VPTCL and Satellite services. The communication will remained blocked in various cities of Baluchistan, Sindh, Punjab and Azad Kashmir regions. Minister further told that he has received requests from provincial governments for the closure of services[/pull_quote_center] He further said that Sindh Government had also requested to put ban on motorcycle till 10th of Muharram in the province for which Chief Secretary has been directed to prepare such a strategy to reduce difficulties for citizens. Nokia Pakistan Facebook Fan Page is Offering Alot!